Project Magazine Hoard = COMPLETE! Confession: I’m a magazine hoarder. I have stacks of magazines spread throughout our house. When I don’t make time to read AND sort my magazines, they quickly start piling up. You can imagine how many stacks I have since I have about 8 different subscriptions. My magazine hoard usually rests on my side of the bed, on the coffee table, or on my computer desk (see above). 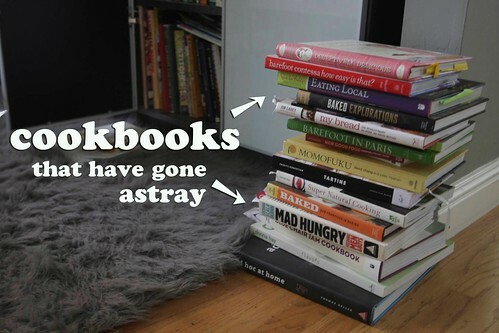 I also have a problem with not putting my cookbooks back in my bookcase! Yes–I’m bad. When I got out of bed this morning and knocked a stack of books on the floor, I knew it was time to tackle my hoard. Today was the day! 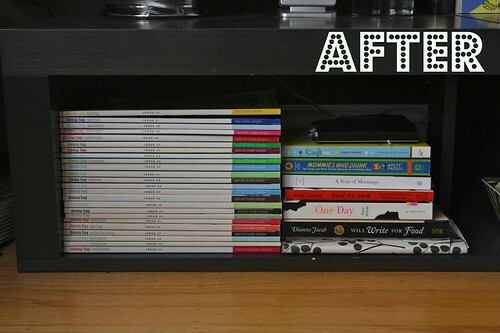 I started off by stacking my magazines & sorting them into piles. Whenever I’m tackling a project like this, I always imagine how much easier it would be to move into a new place without these items. Motivates me like nothing else! 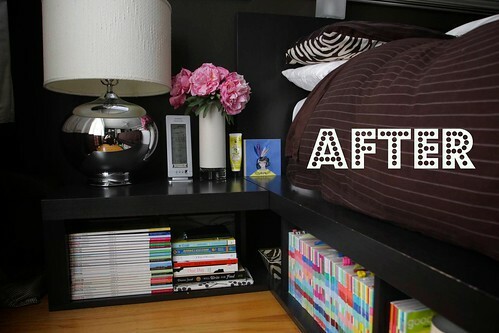 I went throughout the house & gathered ALL of my magazines in every nook imaginable. 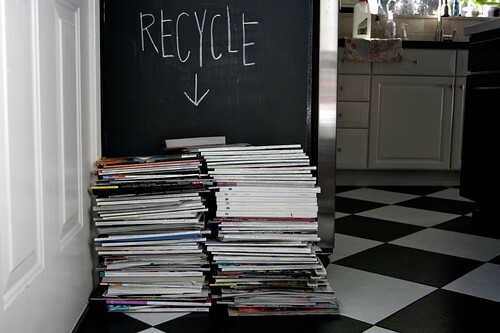 After much thought, I decided to recycle about 80% of my Martha Stewart Living magazines. Since I have issues dating back to 2002, I wanted to keep all of my favorite themed issues: Valentines/Organizing and a limited amount of Summer & Decorating issues. It took a lot for me to say goodbye, but I figured the internet will continue to supply me with inspiration, so why not let it go? The best part is that now I don’t have to house that inspiration. I have pinterest! After I separated them by year, I realized that on the side of each issue was a number. You have NO idea how happy this made me. Thank you Everyday Food for being so organized! So on the side of my bed, I put all of my Donna Hay magazines in a nice stack. And here’s all of the sorted Everyday Food Magazines to the side. This is what my side of the bed looks like now! What a difference! 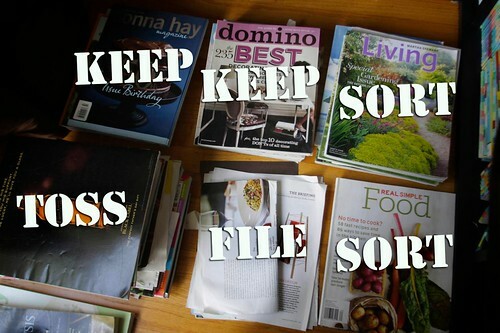 So now…what to do with those cookbooks? In our sitting room, we have a pretty large bookcase that houses my cookbooks, art books, novels & magazines. 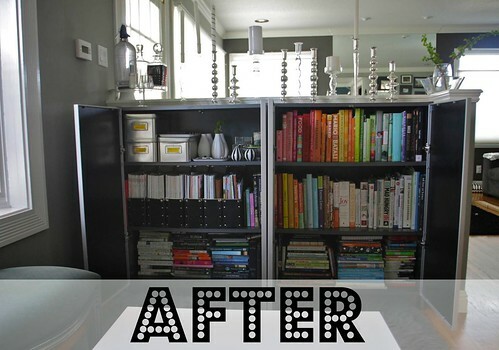 I had it organized once, but didn’t put my cookbooks back properly so things got pretty jammed up. 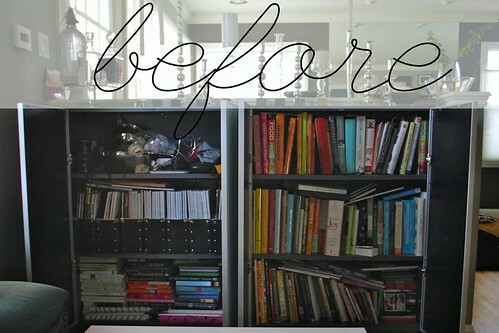 In the upper top left of that bookcase, I have camera gear. You wouldn’t know it because there’s a lot of crap shoved in there. I decided to take a few empty storage containers and sort my stuff. Here’s what it looks like now! My magazine collection has been reduced to this! I can’t part with my Domino & Blueprint collection, so they’re staying! So after a bit of rearranging, I was able to fit all of my cookbooks on my bookshelf! I organized them by color. I always remember where to find stuff that way. So that’s what I tackled today. Took about 3 hours. DAMN, it feels good to depart with this much clutter. I hope this helps inspire you to tackle your own magazine hoard. Just remember, you can always rip things out & save them! You don’t always need to keep an entire magazine. 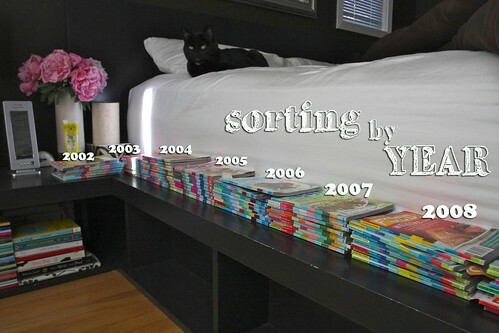 Keep in mind that you’ll have to organize that collection too! 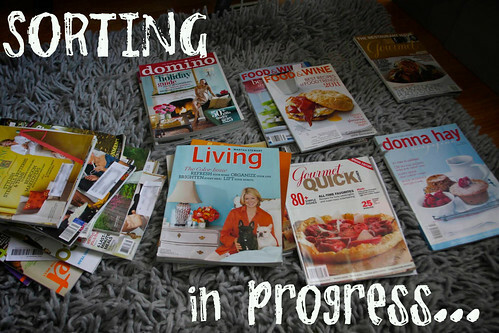 You can check out how I organized recipes from my magazines HERE. 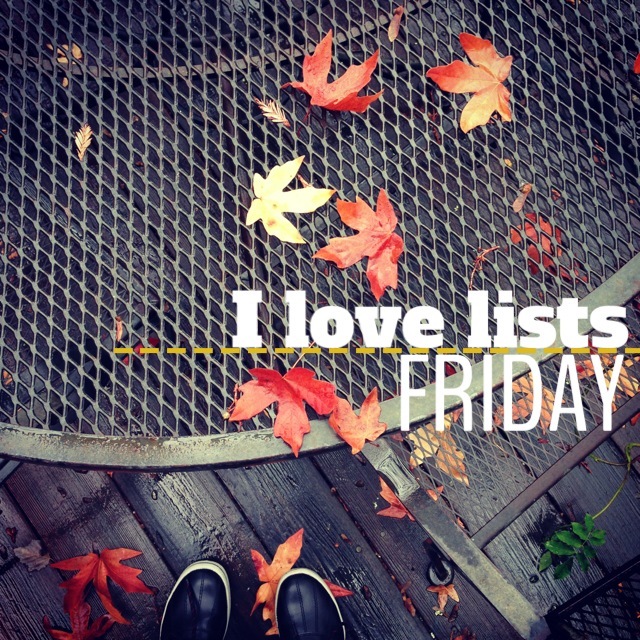 WOW, you did a great job organizing, and your home is beautiful! I LOVE your bed – may I ask where you purchased it? BRAVO. wow! 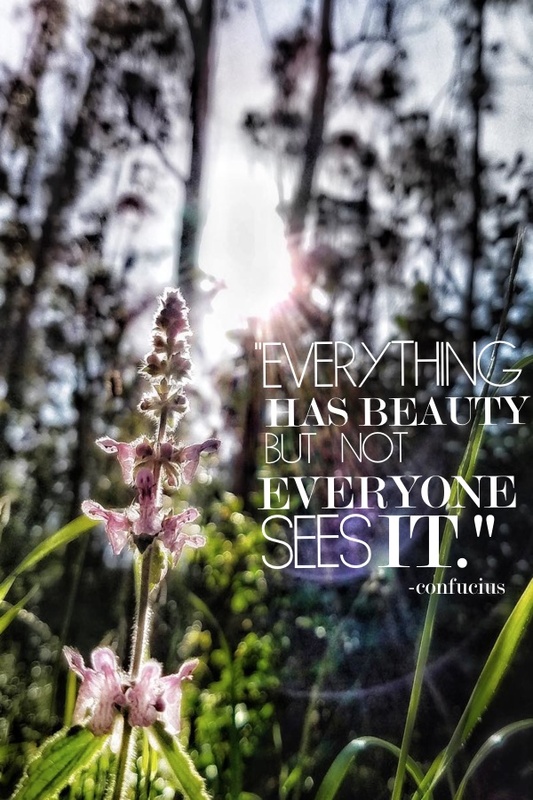 (i’m jealous of your Blueprint collections…..what’s Donna Hay? Sounds familiar….. OOOH!! I’ll have to show you. 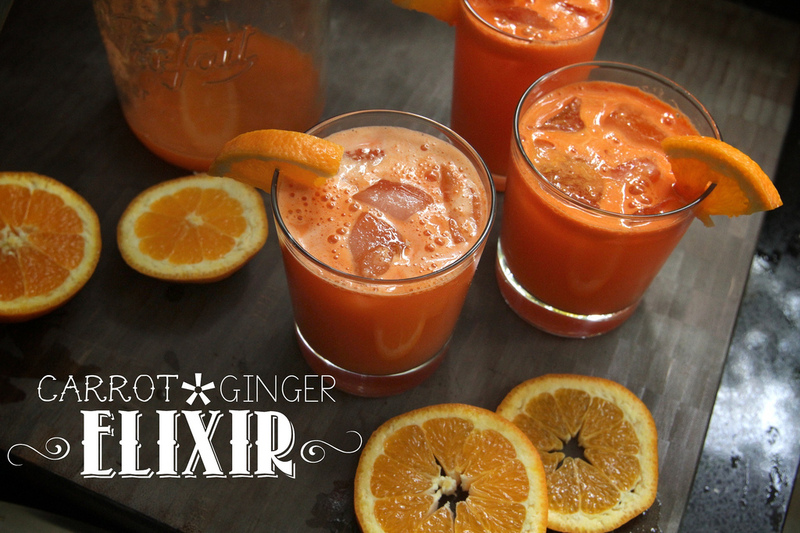 She’s the Australian “Martha Stewart.” The recipes are pretty simple and the photography is AMAZING. 🙂 and YES I will come help you decorate your place! Much more organized! I like how the colors look on the Everyday Food ones. Wow, impressive cleaning job! 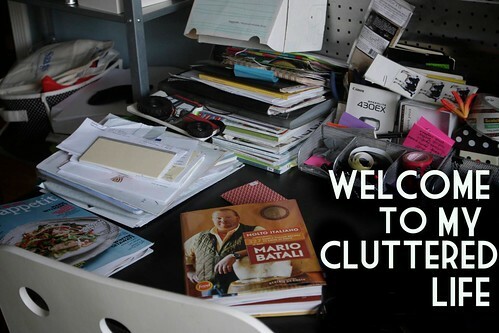 You are making me want to go through my house and organize stuff now. The before shot of your bedside kinda looks like mine does right now. Hmm, I guess I should tackle that first. I have trouble getting rid of my Martha Stewart Living Magazines for some reason. Other magazines get tossed in the recycle bin or passed on at some point but I tend to hoard the Martha magazines. Would you consider mailing off some of those old MSL mags? Postage paid, of course. A friend of mine treasures her collection but is missing a few! Her husband graciously allowed her to keep them when they recently moved. You’re not alone, others are plagued by this plight as well! Sure! I’ll put them aside in my garage. There’s gonna be a lot of them…and the shipping might be crazy. I’ll email you! 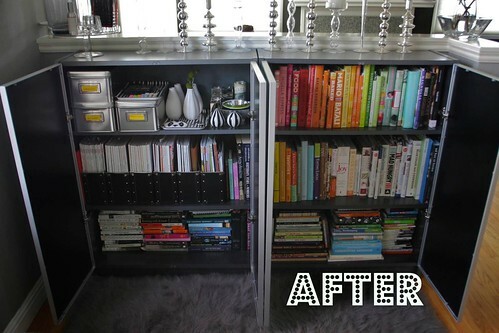 there’s nothing wrong with it, as long as it’s organized and you have space for it! Tracy – it’s funny to read this this morning. I started my sort last night. I don’t get as many magazines as I used to, but they stack up none the less. Love all you ideas. Have a great day. perfect timing! how did you make out? I love your house and magazine collection. Wish I lived closer so I could come and “borrow” from your recycling bin this week. I also never heard of Donna Hay; looking forward to hearing more about her. Ok this was pretty amazing.. I totally understand the magazine hoarding thing. I was forced to ditch that habit when I moved to Charlotte. I love your bed storage!! Those bookcases are fabulous too! I love how you organized by color, I tend to do that with my clothes in my closet 🙂 Now can you come organize my place?? Haha. WHOA you weren’t kidding about the magazines! I have a hard time giving up the Martha’s too.. everything else gets clipped, but those darn Everyday Food mags manage to stay. I can’t believe it only took 3 hours… I get so sucked in to rereading them when I’m organizing. I’ve whittled down our subscriptions to just Donna Hay and pick up other issues as they interest me. I’m not sure I’m saving much money, but this way I’m only buying the issues that I’m really interested in. (Sorry cheeseapalooza issues!) I just wish Donna Hay would take a few more risks with the food photography. Cue sterile backdrop and barnboard cutting board. 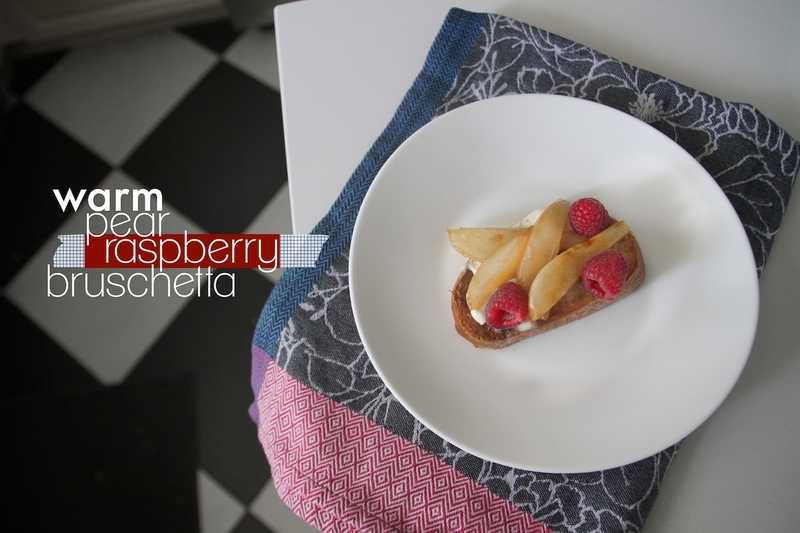 Ok.. wait… we forgot the Scandinavian inspired dishrag!! NOOOOOO! Inspiring! I have been getting food magazines since 1994 and I have always torn out the recipes that I wanted, cut them to size, and taped them into notebooks. 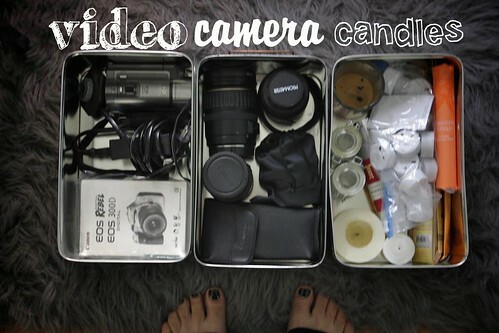 Pretty organized for a very disorganized person. The problem is that I am about 2 years behind. 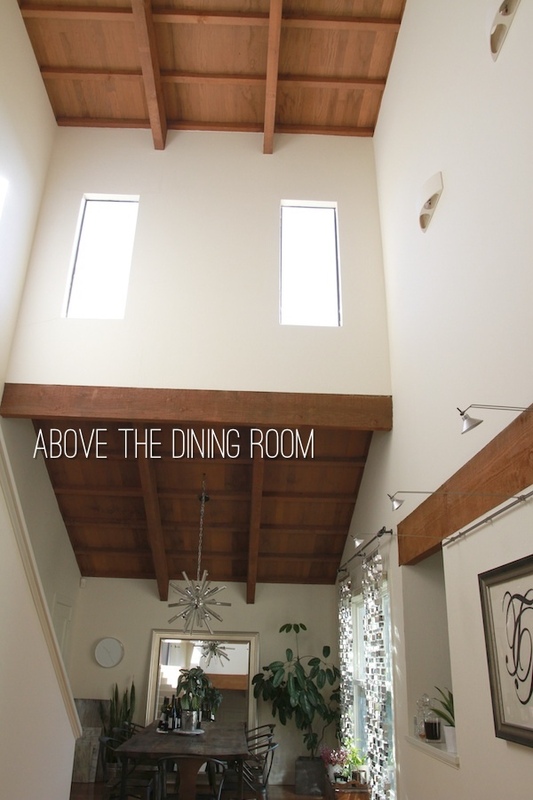 I am going to devote a full day this week to taking on this project! This is my project today! Fun Fun Fun! Dang, you’re awesome!!! I am so bad about piling and not throwing things away, which is why I haven’t allowed myself to get into magazines. pinterest is genius! Wow your collection is pretty impressive! I too cannot part with my domino or blueprint magazines!! We recently moved and my boyfriend pleaded with me to get rid of some of magazines…. 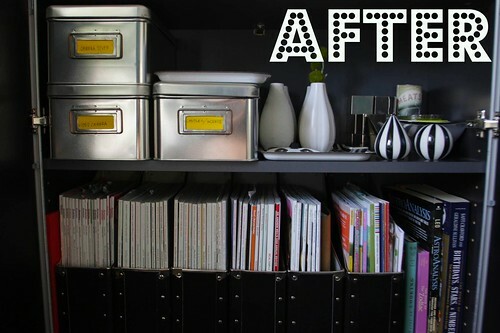 I am a closet magazine hoarder as well, you did a great job, it looks so great all organized! BRAVO! This is the first time I’ve been here but immediately I felt like you were describing myself. I can’t get out of bed in the morning without stepping on a magazine. I do a purge once a year but they still seem to collect faster than I read them. Love your bed – it’s beautiful! You have no idea how mad I am at myself for the infamous day I did this several years back and got rid of my Domino collection!!!! GRRRR. So I’m happy for you that you have the good sense to know to hang onto it. Looks great! I only get one magazine right now, but I spent last weekend going through the file cabinet next to my desk and completely cleaned it out! It’s so nice to have a clean desk and organized drawers. I should have taken before and after shots! wow. ONE magazine??? I can’t imagine. Such awesome ideas! 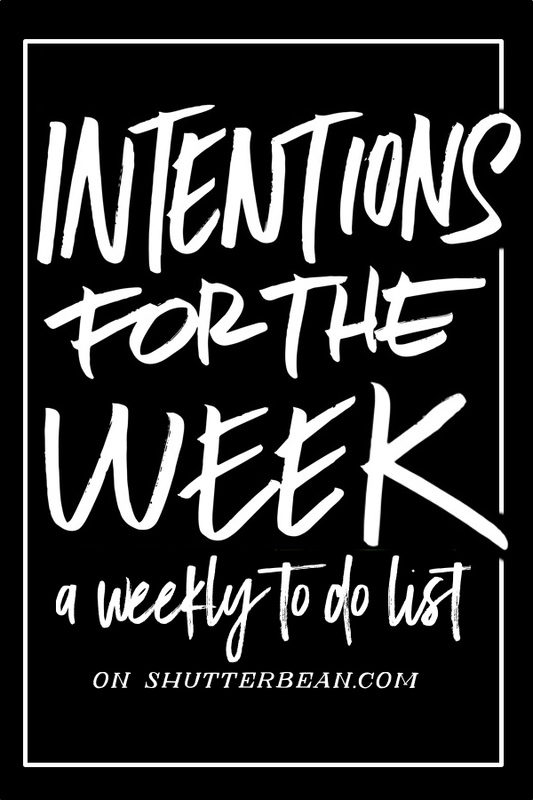 I am also a magazine horder and have taken to tearing out important things and filing them in binders….binders that aren’t big enough though! 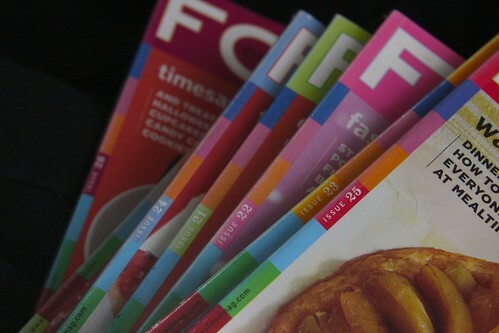 Thanks for the heads up on the numbering of the FOOD magazines. I had no idea! Wow, that is awesome! I was just looking at all of my magazines and books thinking I need to organize the chaos and then read this post. It’s going to be a hard task but your photos are inspiring! p.s. I AM NOT getting rid of my Domino issues!! i miss that magazine so much! don’t you dare get rid of them!!! WOW this is very very inspiring! I’ve been decluttering a lot lately, only I’ve been hard at work at a Trade Show so I’ve not been around to complete the task. 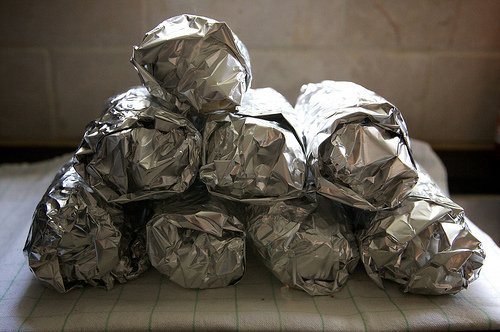 I’m going to get right on the task tomorrow as you have given me the needed push to finish up for 2011. I actually had to purge my collection of food magazines a while ago, we just don’t have the room anymore and Donna Hay was one of the only collections I kept. Great to see she is so far reaching. It is very hard to get rid of those old Martha Stewart mags though…that was the toughest. I do still have the kids/babies issues that I picked up though. Oh my goodness! Thanks so much for posting this! I too am a serious magazine hoarder and it drives my boyfriend crazy! I have them everywhere! 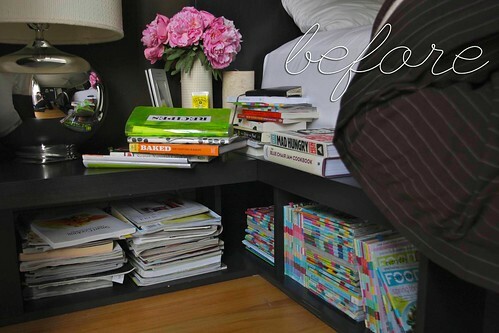 I’m definitely feeling motivated to organize after seeing all that you did. ps. 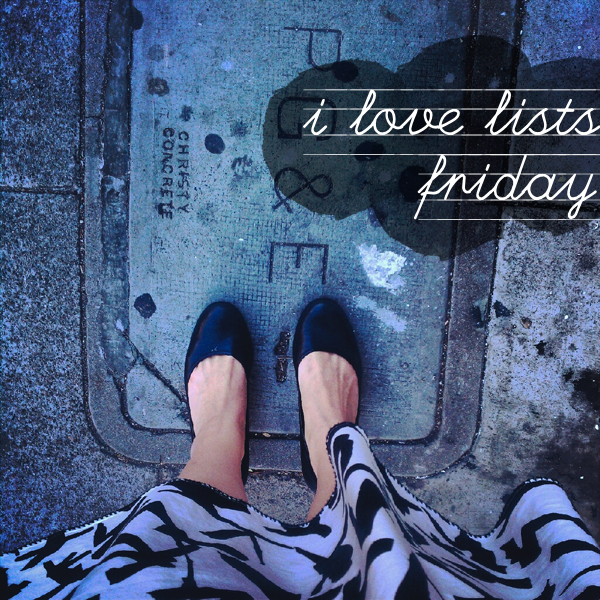 i love you blog! This is great! 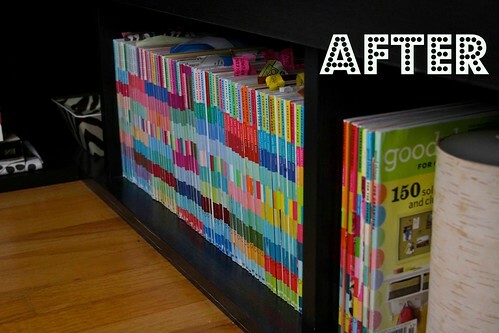 I looked up Magazine organization on Pinterest, of course, and found your post. I’m a magazine hoarder myself. One thing I do when reading my magazines is rip out all of the pages that are ads on both sides. That reduces half the bulk right there! I also read with a highlighter in hand, so I can highlight the good stuff.